Rep. Steve King’s controversial comment made on Twitter over two weeks ago continues to reverberate throughout his rural 39-county congressional district. 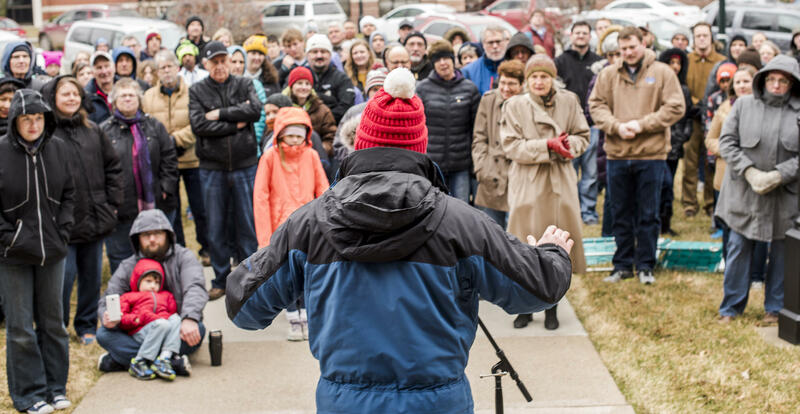 A group of constituents in the most conservative corner of the state took a stand against the Republican congressman, saying that King’s support for a "homogenous culture" does not reflect Iowa values. He criticized Rep. John Lewis for “trading off” his status as a civil rights icon and not contributing anything since then. He asked the rhetorical question whether any other subgroup of people contributed more to society than Western civilization. He has been accused of supporting white nationalism, of being bigoted, racist and xenophobic. He is Rep. Steve King. Fourteen years after electing him to Congress, it seems the people of Iowa’s Fourth Congressional District have grown apathetic toward his headline-grabbing antics. But this time around, King’s comments drew protest in an unlikely place. 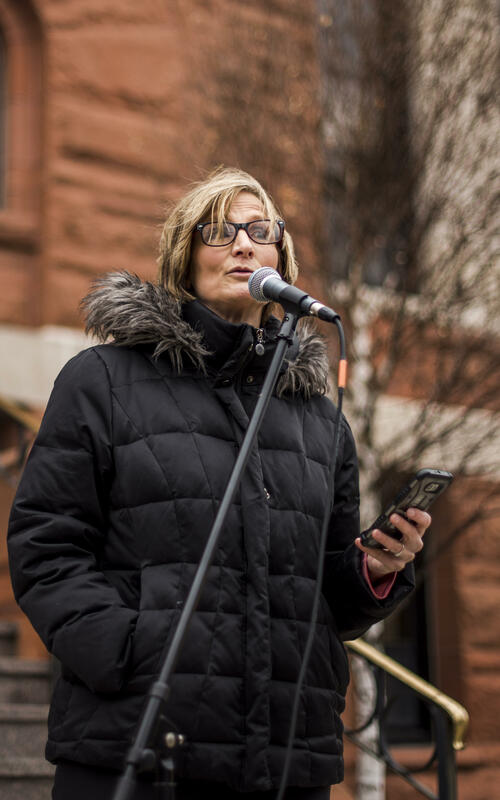 In Sioux County, the most conservative county in Iowa, where King received 80 percent of the vote in the general election, nearly 150 people gathered outside the courthouse in Orange City, Iowa on a cold, cloudy Saturday morning to let it be known that the outspoken Republican’s views do not represent them. The flags whipped in the wind throughout the 30-minute Sioux County Assembly for Diversity, a non-partisan event featuring five speakers. Jim Schaap speaks to nearly 150 people during the Sioux County Assembly for Diversity in Orange City, Iowa on March 25, 2017. 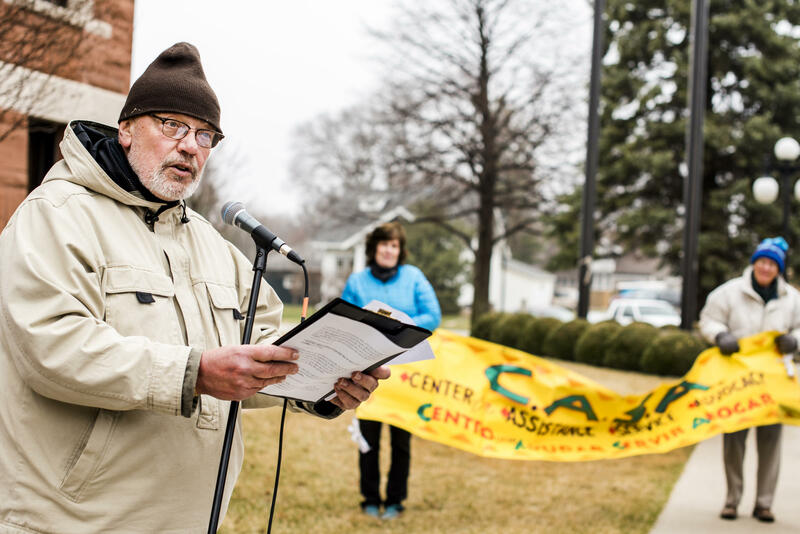 Behind him, two people hold a banner for CASA, a nonprofit organization in Sioux County that promotes healthy, diverse communities through empowerment, education and advocacy. At the Old Factory Coffee Shop, he’s hosted live music, poetry slams and, most recently, community conversations that elevated the voices of Muslims. He lives in a place where pleasantries and politeness prevail, alongside a certain restraint and aversion to confrontation. After all, the person you just tailgated or gossiped about in Aisle 4 might work at the only grocery store within 15 miles or, worse, they might go to your church. Mahr, who grew up in Joliet, Illinois, went to college in Orange City and chose to put down roots here, knowing his liberal views would be among the minority in a county that overwhelmingly voted for Donald Trump. “My friends, they moved up to Minneapolis, and they’re like, ‘Oh yeah, you should move up some place like where we’re at because everyone agrees with you.’ I’m like, that’s not fun to me. I’m not challenged by that,” he said. This blood-red county — the very place where Trump declared during his campaign that he could stand in the middle of Fifth Avenue and shoot somebody and not lose any voters — can be a challenging place to live for those on the other end of the political spectrum and people of color. The U.S. Census Bureau's 2015 American Community Survey showed Sioux County was 88.3 percent white alone. Latinos are a among a growing minority, representing 9.6 percent of the population. Said Ben Saida, of Hawarden, Iowa, speaks during the Sioux County Assembly for Diversity in Orange City, Iowa on March 25, 2017. Said Ben Saida married a farmer’s daughter, and he was embraced by this “backward” town. 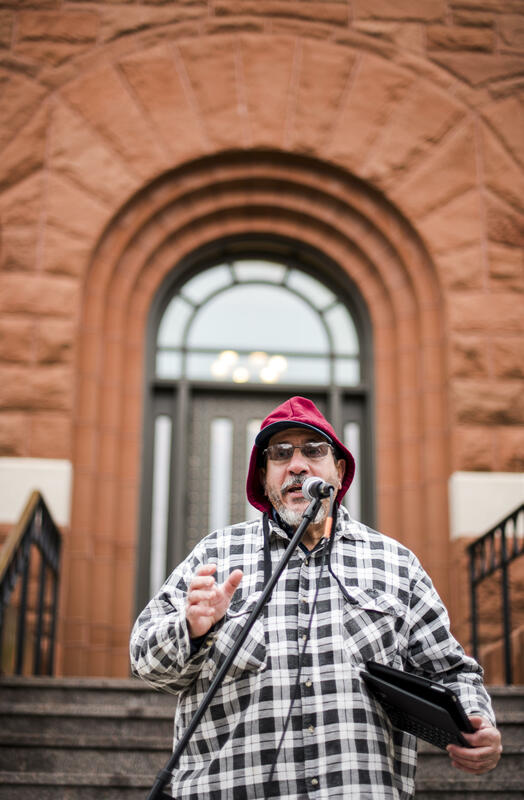 During the assembly, he thanked nearly a dozen community members by name for fending off racism, helping him find a good job, plowing the snow in his driveway, teaching him how to fly and treating him like family for the past 22 years. “Why was I calling this place home? It’s because of its people who opened their hearts to me and gave me a chance to exist in their surroundings. To exist,” he said. Even though the Sioux County Assembly for Diversity was deliberately planned and described as non-partisan, some still perceived it as a little too progressive for these parts — and that was enough to bring dissent among families. “People were messaging me all throughout the week as we were planning things, saying, ‘I’m trying to invite my family along, and they’re upset with me that I’m even going,’” Mahr said. Those that did go heard from people like Mimi Sandbulte. 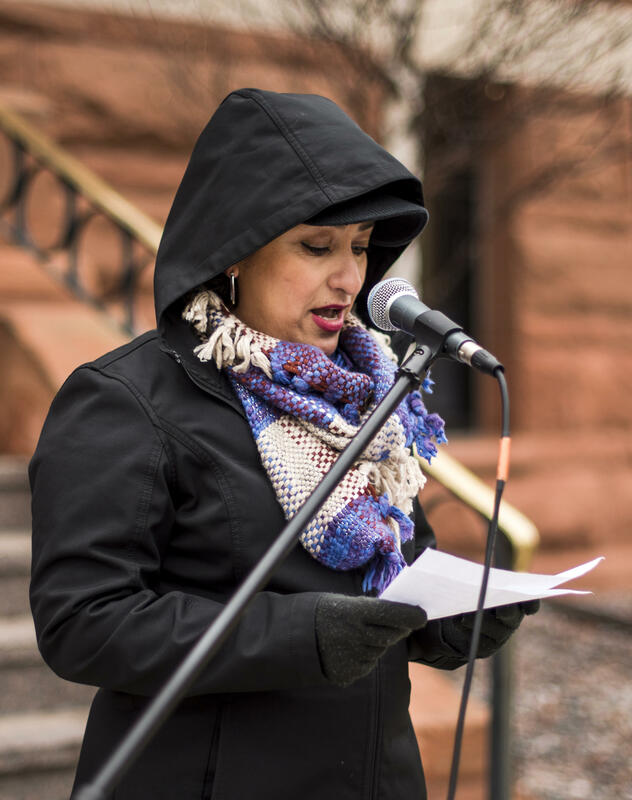 She is an active member in the community, a mother of three and an immigrant from Mexico. Mimi Sandbulte, a Mexican immigrant, speaks during the Sioux County Assembly for Diversity in Orange City, Iowa on March 25, 2017. Sharing in the values of this rural community, she’s involved in not one but two churches — Carmel Reformed, which was started by Dutch immigrants in 1896, and Amistad Cristiana, established nearly 100 years later to serve a new wave of immigrants: Spanish-speaking Latinos. Of the people who spoke at the assembly, only one was born and raised in Sioux County. The outlier was Laura Heitritter, a lifelong Republican who read an open letter to King, detailing her family’s immigrant experience. Like many in Sioux County, her grandfather came from the Netherlands. Her father was a first-generation American. Her husband’s ancestors tipped over their covered wagon outside of Boyden, Iowa, and spent their first winter on the land where she now lives. Laura Heitritter, of Boyden, Iowa, speaks during the Sioux County Assembly for Diversity in Orange City, Iowa on March 25, 2017. Her frustration with King mounted when he doubled-down on his tweet in a CNN interview. “You’ve got to keep your birth rate up, and you need to teach your children your values, and in doing so, then you can grow your population, and you can strengthen your culture. You can strengthen your way of life,” King said. He’s been building a friendship throughout the past year with one of his customers, a Republican counterpart who disagrees with him about everything, but by challenging each other’s views, he said they can support each other and help each other be better community members. Four current and former students from Northwestern College talk about their faith at the Old Factory Coffee Shop in Orange City, Iowa. Two women wearing hijabs appear on a projection screen. Through a video call, Jasmine Smith is joined by another Northwestern College graduate, Marly Melsh. Both are converts to Islam. A crystal bowl whence skyey deeps looked up. Charged with a distillation of haut skies. as though to share the joy with every sense. Of sky and plain was acrid in the draught! How ripplingly the lying water laughed! For musicians, Iowa is often a place to begin, but not a place to end. This has been true for a long time, and it has left us in the difficult position of growing our own music culture. "Now, boys, is our time for fun." That's what the hoity-toity artist said when he saw a herd of buffalo Comstock, the rancher, had spotted along the Republican River. Albert Bierstadt was on his way back from California when he and the newspaper man traveling with him stopped at the Oak Grove Ranch and decided to try his hand--not at hunting buffalo but painting them. Comstock and his men armed themselves with rifles; Bierstadt packed brushes. He wanted an angry bull, he said, "so mad that he'll bellow and tear up the ground," Bierstadt told Comstock.